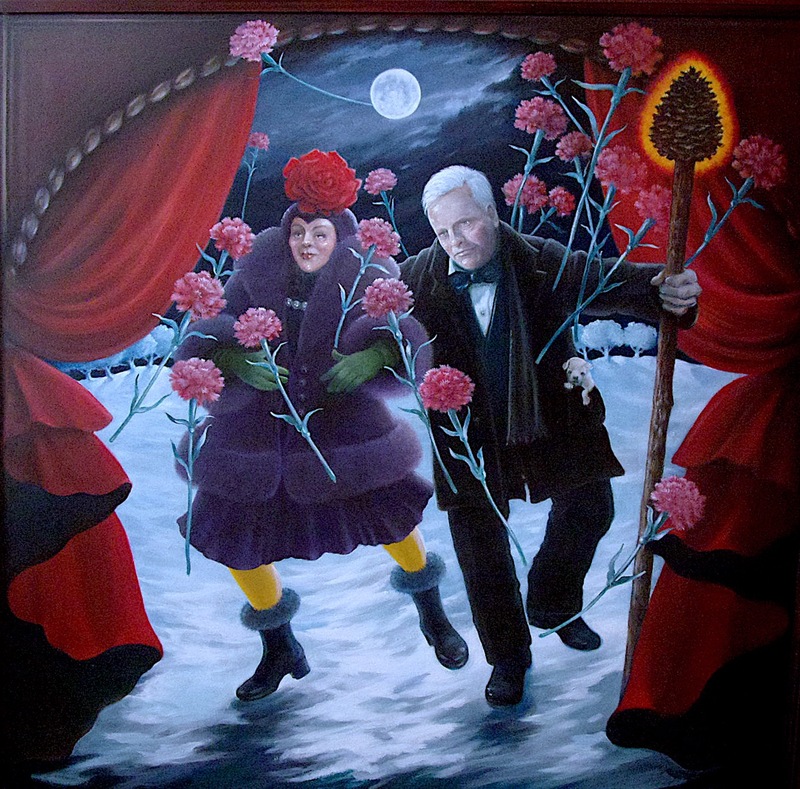 This piece began as a relatively simple painting of two dance hall performers. Less than thrilled with the finished product I decided to make some edits, and the work became more and more elaborate with ever spiraling, synchronous and personal associations. I began the adjustments in winter, during a month with two full moons... the second full moon a relatively rare event and referred to as a "Blue Moon". "The Fool" has the face of Curt Jergens, a German actor. I've always liked his face, his white hair and blue eyes reminded me of my Great-grandfather. My Great-grandfather or "Pa" was married to "Mutti" as in "Mutti and Pa". Ariadne's face is an amalgam of several people who I have admired. The hands are mine. Pa was a baker. He served on a U-boat during the first World War. He married Mutti after the war. Mutti's husband had left her, my grandmother Christine and her sister Frieda for parts unknown. He said that he would send for them all, but never did... no one ever knew what had happened to him. Years later Pa made the same promise. I can only imagine Mutti's anxiety. Pa, however, did send for his adopted family after settling in Illinois. There is a story about Ariadne and Dionysus... Dionysus looked down from Mount Olympus and saw an abandoned Ariadne, weeping and mourning the loss of her unfaithful lover, Theseus... all of this after she had taught the duplicitous Theseus a dance to escape the Minotaur. Moved by her plight and her bravery, Dionysus fell in love. Dionysus is the inspiration for "The Fool" a character represented in Tarot Decks ...he carries a staff, holding his belongings, ready to step into the unknown. During the Biedermeier period in Germany, elaborate flower arrangements often conveyed remarkably complex messages. Pink carnations told the recipient that they were unforgettable ...the sender has declared "I will always be there for you". There is also a connection to Our Lady of Guadalupe who brought forth miraculous roses in the snow. Ariadne wears purple and yellow, balancing the mystical and the intuitive with an entirely epic rose crowning her head. She is a "Pearl of Great Price". A most worthy woman. Entire and equal. The happy pair appear ready to dance out of the picture frame. Finally. You just never know where the fates will lead you I suppose. This painting was completed in late 2012. I recently photographed the work. I am a better painter than photographer... but you get the idea.